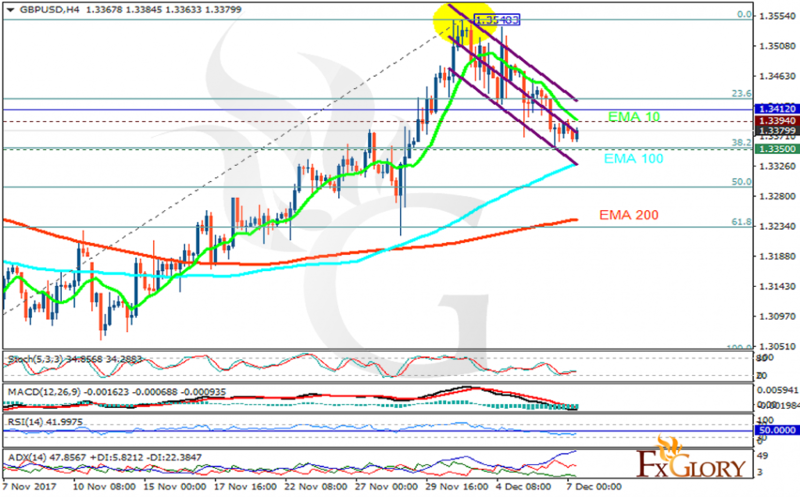 GBPUSD is under pressure due to the Breixt issue, and today there are no major economic reports in the UK therefore it is most likely that this currency remain under pressure. The support rests at 1.33500 with resistance at 1.33940 which both lines are below the weekly pivot point at 1.34120. The EMA of 10 is moving with bearish bias in the descendant channel and it is above the EMA of 200 and the EMA of 100. The RSI is rising towards the 50 level, the Stochastic is moving in low ranges and MACD line is below the signal line in the negative territory. The ADX is showing sell signals. Short positions are recommended towards the 61.8 level of Fibonacci.